Home » Blog » It’s Here! The YASH Spring 2016 Contest! Welcome to my official YASH Spring 2016 contest post! This semi-annual event was first organized by author Colleen Houck as a way to give readers a chance to gain access to exclusive bonus material from their favorite authors…and a chance to win some awesome prizes! At this hunt, you not only get access to exclusive content from each author, you also get a clue for the hunt. Add up the clues, and you can enter for our prize. One lucky winner will receive one signed book from each author on the hunt in my team! But play fast: this contest (and all the exclusive bonus material) will only be online until Sunday, April 3 at 3 pm, Eastern time! 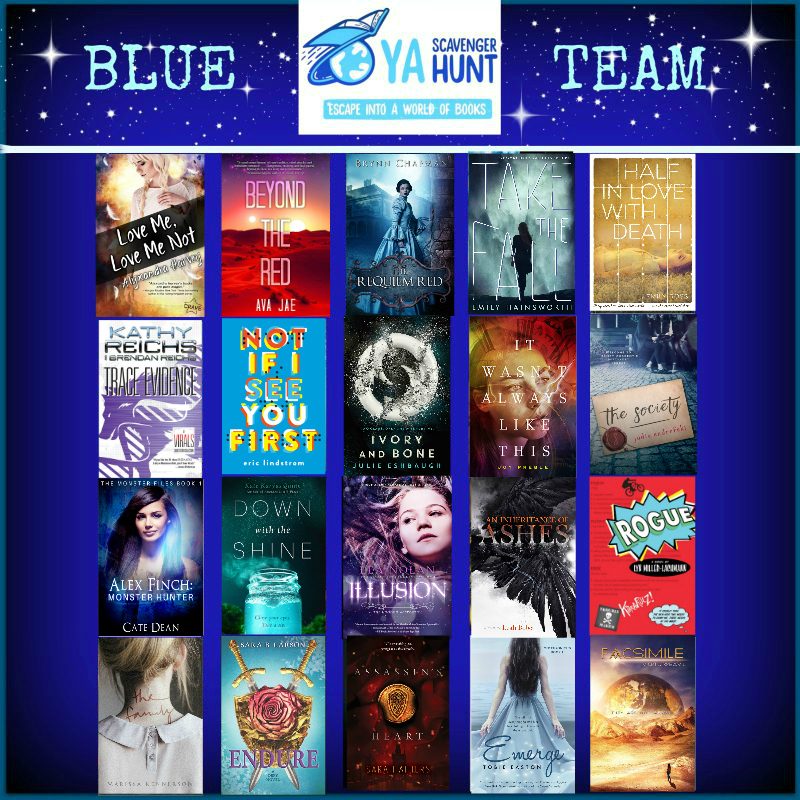 Go to the YA Scavenger Hunt page to find out all about the hunt. There are NINE contests going on simultaneously, and you can enter one or all! I’m part of the BLUE TEAM–but there are seven other teams that offer a chance to win a whole different set of signed books! Rules: Open internationally, anyone below the age of 18 should have a parent or guardian’s permission to enter. To be eligible for the grand prize, you must submit the completed entry form by Sunday, April 3rd at noon Pacific time (3 pm Eastern time). Entries sent without the correct number or without contact information will not be considered. 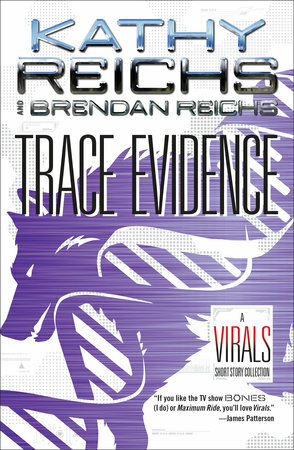 After three long years working as a litigation attorney, I abandoned the trade to co-write the Virals series (Virals, Seizure, Code, Exposure, Terminal, and Trace Evidence). This is not a decision I regret. And I’m happy to announce a new two-book deal with my friends at Putnam for my debut solo YA series, NEMESIS. 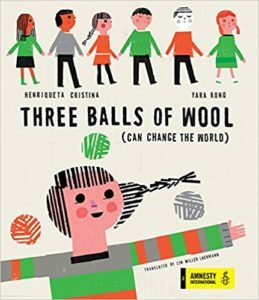 Look for it in Spring 2017! Very. Excited. 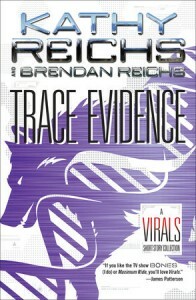 Brendan’s latest book is Trace Evidence, part of the Virals series. Fans of the Virals series will be thrilled with this companion volume that includes three short stories originally published as eSpecials as well as an all-new, never-before-seen Virals adventure! Shift, Swipe, Shock and the new story SPIKE – set after the events of the last full length book, Terminal – give further glimpses of the Virals’ world as they work with Tory’s famous great aunt, Temperance Brennan, to solve more mysteries. Take a look as where it all started before they became Virals and get to the bottom of an attempted sabotage and Kit and Whitney’s wedding. 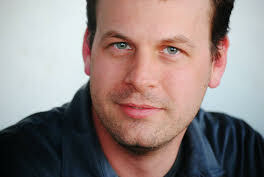 Brendan’s bonus material is from his story SPIKE. This material will only be live for the duration of the scavenger hunt, so enjoy it while it lasts! Now it’s time to write down the magic number. My YASH featured book is Rogue, and the number is 266, because when Kiara posts her videos online of the BMX bikers, she does so as rogue266. The next stop on the hunt is Joy Preble, but before you go, I have my own giveaway below. Science fiction or fantasy? Speculative fiction is hot, but which one do you prefer? If it’s sci-fi, I have a LEGO spaceman for you. If you’re a fan of fantasy and you win the drawing, the Golden Warrior, aka the Chosen One, will wing its way to your door. If you’re like me and prefer historical fiction, I feel your pain. If you comment for historical fiction and win the drawing, there will be a special surprise for you. Sci-Fi or Fantasy? Or neither? You decide. Thank you for the first entry and good luck in the drawing! If you have time, check out more of my Lego pictures on this site and my Instagram feed (which I’m weeks behind in updating). Thank you, Pamela! Good luck in the drawing! Thank you, April! Enjoy the YASH contest and good luck! Thanks for writing in, Vickie! And good luck in the drawings! historical fiction all the way for me. just something about time period pieces(writings) i love them. thank you for the chance to enter. Happy Week. Great! The prize won’t be a Lego item because I gave away my historical figure in an earlier drawing, but if you win, you’ll like it. And I’m going to list some of my recent favorite reads (mostly adult novels) on my blog after the scavenger hunt ends. Thank you, Faith! 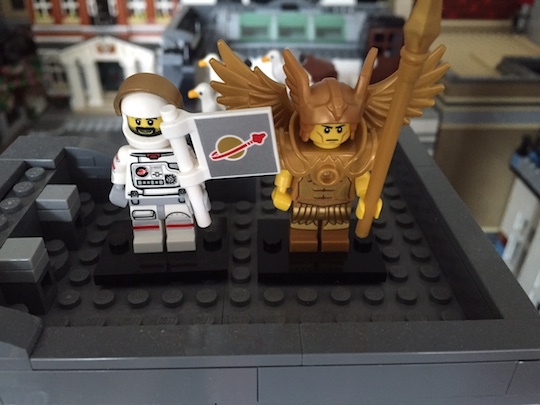 The fantasy minifigure also has more pieces than the space one, though I like the spaceman’s beard. So what happens if the answer is all of the above? I honestly read all 3 genres depending on my mood. 🙂 I started reading fantasy and science fiction as a middle schooler though when I had a teacher who encouraged me to read what I wanted and not what teachers and others told me to read. Then you should pick based on the prize you like best. Behind Door 1 is the Spaceman. Behind Door 2 is the Golden Warrior. Door 3 is the mystery door, but it has something to do with historical fiction. Please let me know! And it’s great that you read a variety of books. I used to read only contemporary realistic fiction and historical nonfiction but have widened my choices as well. I think it makes me a better writer because I can use what works in one genre for another. I am picky with my fantasy and sci-fi books. I do love a good historical fiction. I’ll put you down for historical fiction, then! Good luck, Tammy! Yes! Thank you and good luck, Sabrina! I own more fantasy books but have read more science fiction books so I guess science fiction? Good! We wouldn’t want the spaceman to feel less loved. Thank you and good luck, Morgan! It’s really hard for me to pick just one of those genres, cause I honestly love all three, but I think I’m going to have to go with fantasy! I do like that minifigure; it’s one of the more creative ones of the series. Thank you and good luck in the drawing! I’m glad you enjoyed the pictures. I’m way behind on putting up new ones, between writing and translation projects, and a building I designed to fit into the modular theme. Okay, but in all reality, historical fiction rules. Sally Gardner’s Red Necklace is one of my all-time favorites. Thank you, Cassandra! I’ll have to check that one out! My current read is an adult novel set among the nobility of Barcelona, Spain in the 1920s, Josep Maria de Sagarra’s Private Life. I know a lot about Portugal during that period because of my own work-in-progress, so it was interesting to see what was going on in the neighboring country. Thank you, Emily! Good luck in the drawing! I like both genre’s but I lean just a tad more towards fantasy. And that’s a cool minifigure too! Thank you, Michelle! Good luck! The Lego men are so adorable! But…out of the two, I prefer historical fiction. Whoops. Thanks so much for hosting! I actually like both but I tend to gravitate more to fantasy. Got it! Good luck in the drawing, Elisa! Thank you, Maidelyn! Good luck! Historical Fiction…not that I’ll say no to a good Fantasy. Thank you, Anna! Good luck in the drawing! Spaceman is your friend! Thank you! Thank you, Tasia! Good luck in the drawing! Thank you, Nicole! Good luck in the drawing! It’s hard to pick from fantasy and historical fiction. I love both! I’ll go with fantasy, though. 😀 Thanks for being a part of the hunt and for the giveaway! Thank you for joining in! The hunt would be nothing without you. Thank you, Tamsan, and good luck in the drawing! Though I’m starting to like fantasy a bit more, my favorite genre will always and forever be historical fiction!! Loved Gringolandia! Thanks for the giveaway! Thank you for commenting, Stephanie! I’m thrilled that you enjoyed Gringolandia! Have you seen its long-awaited companion, Surviving Santiago, yet? No, I haven’t. I’m so excited to know that there’s a sequel. Just added to my TBR list. I’m tempted to say fantasy because my 3 boys would LOVE a new Lego. But, I really prefer Historical Fiction these days! Historical fiction has always been my first love! But Fantasy is a close second. Thanks for this opportunity! And then there’s historical fantasy! Thank you for your comment and good luck in the drawing! Thank you, Miki! Good luck! Thank you, Kristen! Good luck in the drawing! Thank you and good luck in the drawing, Pamela! I’d have to pick Fantasy if I had to choose just one but Historical Fiction is a close second if not an outright tie for first. I’ll put you down for Fantasy, but if you win, you still have a chance to change your mind. They often are! Thank you for commenting, Emily! Thank you, Ashley! Good luck in the drawing! Thank you and good luck in the drawing, Erika! I do have some minifigures that would work for urban fantasy. If you win, I’ll pick one out for you instead of the warrior. Ack! Can I say historical fantasy? *wink* but…I’m leaning towards fantasy. Thank you, Melissa! I have you down for fantasy, but you can switch later if you win. Historical fantasy is such an interesting genre because there are so many variations. One of my favorite books of 2014, Marjorie Agosin’s I LIVED ON BUTTERFLY HILL, was an alternate history, and I just found out there’s going to be a sequel. I like a good book that incorporates two or three. There are several good books out there with a time travel aspect into the past. Since I also like a mystery, I’ll pick historical fiction for a chance at what’s behind the mysterious door number three. Yes, surprises are fun too! Thank you, Sherry! And if you win, you get the surprise! Good luck, Nicole! I love fantasy, but a good historical fiction book is always fun too. I’ll put you down for fantasy, but you do have a chance to change your mind if you win. I am a lover of historical fiction! Thank you, Stephanie! Good luck in the drawing! Fantasy is my favorite genre! Thank you for commenting and good luck in the drawing, Lillian! Got it! Good luck in the drawing! Oh my that’s a hard one. I love sci-fi and fantasy so much! But I’m going to have to say fantasy! And that warrior minifigure is so cool, too! Fantasy. But I’d love a combo of fantasy, sci-fi and historical. Wouldn’t that be cool! You could have a time travel into the past and the future! Got it! Thank you for entering, Elle. Thank you, Amy! Supposedly there are more Lego people in the world today than real people. I’ve entered you for the Spaceman, then. Good luck in the drawing! Thank you for participating, Agustine! Good luck in the drawing! It is international, because the little guys don’t cost that much to send. Good luck in the drawing! The Spaceman looks pretty hard-core, so I’ll put you down for the Golden Warrior. Good luck in the drawing! Good choice! Good luck in the drawing! And that Golden Warrior is so cool! Thank you for commenting, Sabrina! I keep hoping that historical fiction will come into fashion because that’s what my next project is. But it’s hard to write quickly and write well because of the amount of research involved unless you’re writing a sequel or series, as Surviving Santiago was with Gringolandia. Got it! Thank you for stopping by! That Golden Warrior is hard to pass up. Good luck in the drawing! Historical fiction is my absolute favorite! Thank you for your comment and good luck in the drawing, Melanie! Thank you, Elayne! And good luck in the drawing! Thank you, Stacey! Good luck in the drawing! Thank you for entering and good luck, Genaia! i like fantasy and historical fiction! If you win, you can choose then. Good luck in the drawing, Lisa! Thank you and good luck in the drawing, Yuliya! Historical fic (though I do enjoy the other genres too!) but there’s just something about historical fic that calls to me! Same here! It’s because no matter what, you learn something new about a different place and time. And you experience what it was like to live then, which you don’t get from a textbook. I enjoy those genres but if I had to pick one right now it’d be historical fiction. Good choice! Thank you for joining the hunt and good luck in the drawing. Surprises are usually the most fun! Thank you, Stephanie! Good choice, Brianna! Thank you for taking part in the hunt and good luck in the drawing! Out of the three, I would pick historical fiction, even though I also really enjoy sci-fi and fantasy. Thanks for the fun giveaway and for being part of YASH! Thank you for participating in the hunt, Carolyn! It wouldn’t have happened without you and all the other participants. Good luck in the drawing! Thank you, Maya! This was a particularly adorable minifigure series from Lego. There was one last year that I didn’t buy any of the bags. OTOH, the Monsters series in the fall was one of their best. Great! I have you down for the warrior and will be drawing soon. Good luck, Charlotte! Got it! Thank you for taking part in the hunt, Hailee, and good luck in the drawing! I think I prefer Fantasy, but I like both. 🙂 Thanks for participating in the hunt! If your name is picked, you can change your mind then. Good luck, Kassiah! Thank you, Annie! When I started writing, I used to read and write only contemporary, even though I have a degree in history. It was only later that I learned to appreciate the value of historical fiction as a way of experiencing a time period from the perspective of people who don’t often show up in textbooks. Thank you, Christina. If you like my Lego pictures, you should check out my Instagram photos, as well as the Lego-related posts on this blog. And I enjoyed hosting Brendan. I’m thrilled that he has his own series, coming out in 2017. Sci-fi! Just because the astronaut’s cuter. The beard! Even though Lego doesn’t have great historical collectible minifigures, they have some nice historical buildings in the Modular theme, all of which I have in my Lego town. Then, there are the Castle and Pirate themes, with their castles, medieval villages, and ships. Two years ago, I attended the Lego Fan Event in Lisbon, Portugal and photographed an elaborate medieval display. They’re now the most frequently viewed photos on this site. So even if Lego doesn’t have what we’re looking for, we fans are very creative. Wow, Lyn! Awesome response! I love both, but fantasy probably gets the edge!